Fairness: De-emphasise the perceived injustice of ‘free-riding’ and explain that while 100 percent compliance is unrealistic, if most growers do their bit (e.g. apply protein bait sprays early), then everyone will be better off. Competence: Provide simple information about what is required for practical AWM. This may include examples of on-farm Qfly management activities (e.g. bait spraying, trapping, orchard hygiene) as well as coordinating with neighbours. This can be done by providing information directly or by providing links or contact points for this information. Communication channels: Identify key community leaders or sources of information that can be readily accessed for more information and tips. Growers also indicate that they receive most threat-related information through industry or government agency sources (e.g. industry association newsletters, expert seminars provided locally). Governance: Transparent explanation of governance and funding arrangements for area-wide management activities, and whether individual engagement will be monitored. AWM is easy: Explain how AWM activities can integrate easily into existing farm activities/practices. Community spirit: Social research shows most growers feel it is important to do the right thing by their neighbours and the community. Emphasise the benefits of their participation in AWM to their local community and the region as a whole. Relative advantages: Make explicit the ways in which AWM involvement can benefit growers, and how early action can help to manage Qfly into the future. 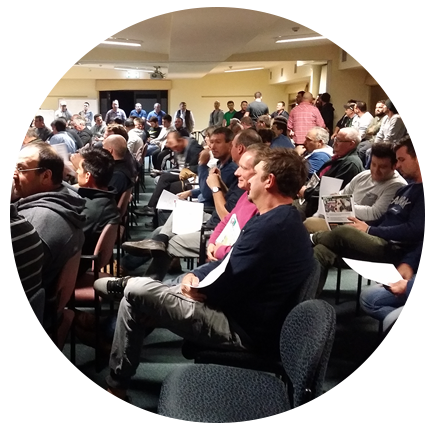 Targeting growers: Target growers who are keen/motivated to participate first, as this group of growers may be more likely to be engaged with the process and adhere to AWM principles early on. Then from this group more momentum can be created to get buy-in from other groups. Fairness: De-emphasise the perceived injustice of ‘free-riding’ and explain to communities that if everybody does a little bit (e.g. hangs 1 trap every 3 months), then it becomes fair to everyone. Competence: Provide hands-on examples of simple Qfly management activities that everyone can do (e.g. hanging up traps, refilling traps, efficient ways of clearing trees of unwanted fruit, quick and easy clean-up strategies for fallen fruit, setting up nets). This can be done through local council initiatives or through other local public/private groups (e.g. Rotary, Bunnings, garden clubs). Communication channels: Identify key community leaders or sources of information that can be readily accessed for more information and tips. Local government are a trusted source of information for urban residents. Residents also indicate that they receive most threat-related information through local media and advertising campaigns (e.g. ‘No flies on us’). AWM is easy: Explain how AWM activities can integrate easily into existing daily activities/habits. What do others think? Emphasise that social research shows most local residents are keen to be involved in helping to manage Qfly, and want to help improve the local economy through helping local industries. Encourage people to talk to friends and family, or neighbours, with fruit trees to hear their experiences with Qfly. Relative advantage: Make explicit the ways in which AWM involvement can benefit townspeople and farmers, and how a little bit of action now can help to manage Qfly into the future. Targeting residents: Target communication programs first towards residents with higher income, higher education, well connected in the community, and avid gardeners, to get the initial buy-in. This is the group of residents that show a higher level of willingness to pay to support an AWM program. Women will also be more supportive of an AWM program than men. Then from this group more momentum can be created to get buy-in from other groups.